For this week, I have opted for yet another bold shade from Nails Inc. Last week I wore an old polish in the form of Judo Red from Nails Inc's collaboration with Victoria Beckham. This week I have gone for Golden Lane from the "stay bright neon collection' which is part of their new 2016 summer releases. The collection consists of four colours, a fluro coral shade, an electric pink shade, shocking yellow and a neon orange option. I am sure you can tell which one I went for. As you can see Golden Lane truly is as shockingly bright as it's colour description and I love that. 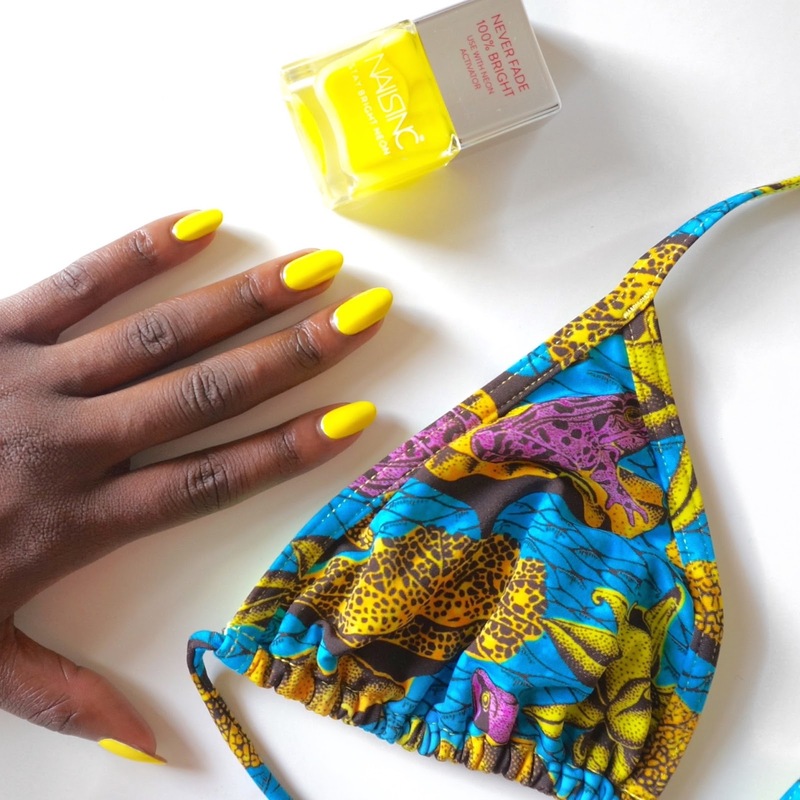 Check out how you can achieve your very own neon bright manicure at home with a few simple steps listed below. 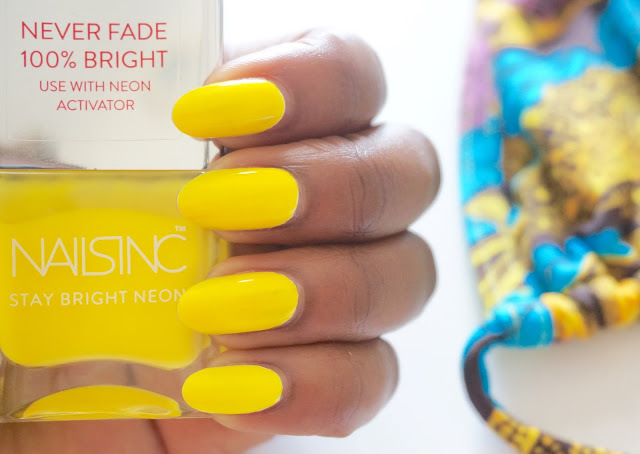 The above picture shows all that you need to create your very own neon manicure finish. 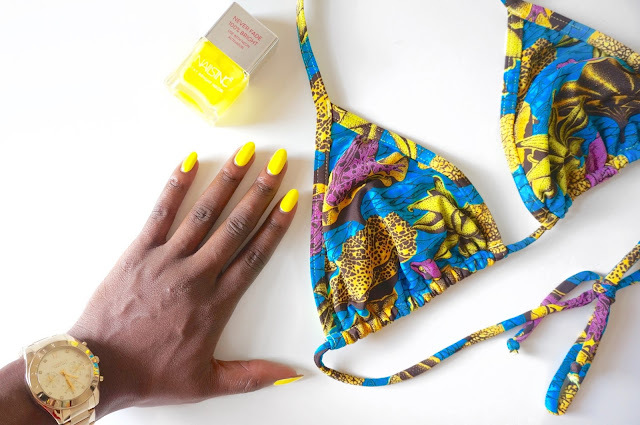 STEP 1: Apply a layer of Nails inc. superfood base coat to prevent staining your nails with the bright polish and to also provide nourishment to your nails. STEP 2: Apply a thin layer of the Nails inc. neon activator and allow to dry. STEP 3: Apply two coats of the neon polish in my case golden lane or just one layer of the neon polish if you prefer a brighter finish. STEP 4: Round things up with a final coat of Nails inc. Kensington Caviar top coat which will have your nails touch dry in 45 seconds. As I have said previously, it is hands down one of the best top coat's that I have come across to date. It keeps my nails looking glossy for an extended period and I love that my hands can function once the polish is touch dry. The entire stay bright neon collection screams carnival to me and I will most definitely be wearing a colour or two when carnival draws near. In the mean time I will be sharing swatches of the other colour ways from the stay bright neon collection as the weeks go by. *pr sample c/o Nails Inc.